Want to add a little polish to that chunky winter knit? Sorted. Leather-look leggings are the perfect pairing. Throw on a leopard print coat like model Rosie Huntington-Whitely for an effortlessly chic outfit. Statement sleeves? It’s a yes from us and actress Kate Beckinsale who wears her leather leggings with a chic blouson sleeve top. Steal her look with our leggings and sheer sleeve ruffle top for the perfect day-to-night outfit. Take your style cue from supermodel Cindy Crawford and pair your leather look leggings with a leopard print shirt. Both staples in our collection, leopard print and leather go together like gin and tonic. Why not try a double dose of leather by styling your leggings like model Heidi Klum with a black biker jacket. Complete the edgy look with a simple black polo and courts, perfect for a night out. 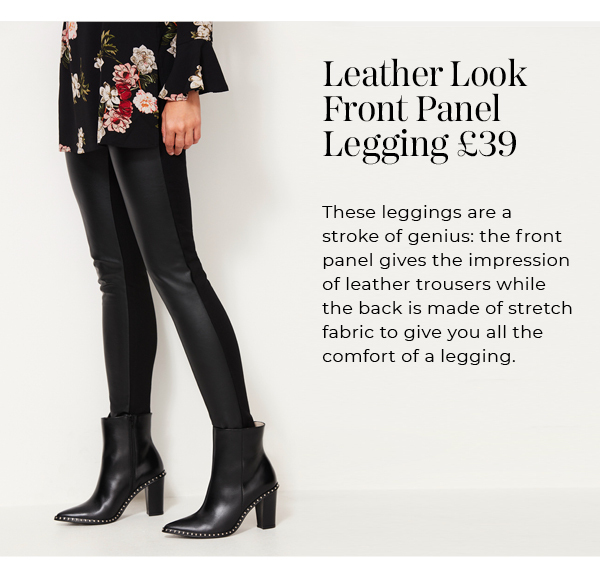 Dress up your leather look leggings like singer Nicole Scherzinger with a sharp blazer and a delicate lace detail top, perfect for a night out. Just add a pair of killer heels.